If you are looking for one of a kind, unique wedding venue in Philadelphia, look no further than the Cescaphe's Downtown Club. If you prefer a classic and elegant yet chic and sophisticated setting for your wedding ceremony and reception - the answer is - Downtown Club. This Philadelphia's wedding venue has a special place in my heart for one particular reason. Years ago we photographed a stunning Downtown Club wedding for one incredible couple and that was the first wedding that introduced us to Cescaphe's family. Needless to say, that after an incredible experience of working with this Philadelphia premier wedding catering company, Cescaphe's venues became our favorites. We've worked at the Downtown Club numerous times since that wedding but every time we are back, I have the same feeling of excitement! 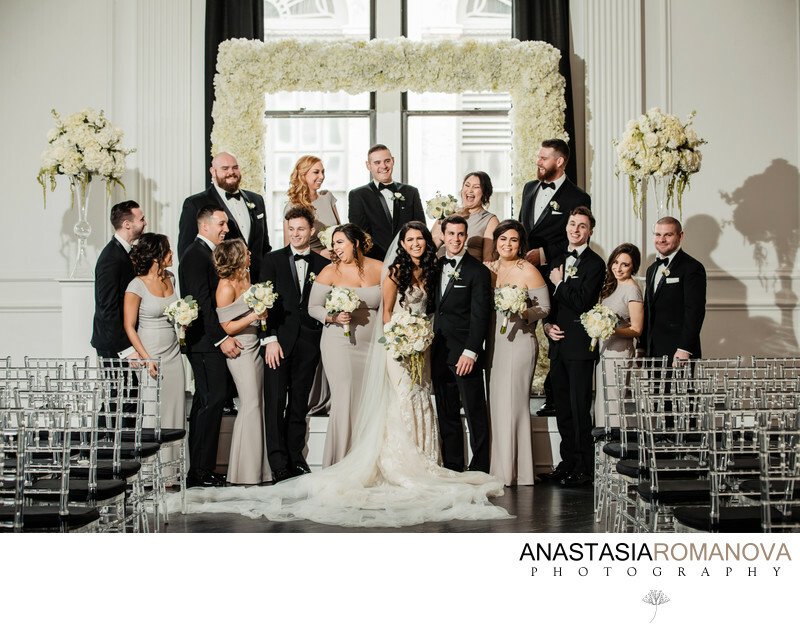 If you are planning your Big Day at the Downtown Club, you probably already know that there are plenty of unique gorgeous opportunities for wedding photos inside the venue itself. Let's just take a look at the Downtown Club's stunning bridal suite. With tons of natural light and huge windows, reflective glass table and a huge vintage mirror - the bridal suite has everything you need to create some breathtaking getting ready photographs on your wedding day. Another beautiful backdrop that is one of my favorite at the Downtown Club is the marble staircase leading from the bridal suite to the main floor. It is a cool spot for some creative portraits of the bride and groom together or just the bride alone before the ceremony. One of the photos that I've always considered as a must-have is a photograph of the bride and groom in the empty reception room. Whether during the daytime or nighttime, we can create some mind-blowing portraits of the two of you together surrounded by all of the beautiful decor and floral arrangements. The Downtown Club's ballroom can also serve as a great backdrop for your family and bridal party photographs, especially if it is raining or too hot outside. There are so many wonderful outdoor locations for wedding photos that are just a few minutes walk from the Downtown Club. Among our favorites are the Washington Square Park, Second National Bank of the US, 18th Century Gardens, The Merchants Exchange Building etc.